What makes the Australian Labradoodle different from any other Labradoodle? It’s quite the different crossbreed actually. There’s much more to it than just the genes of Poodle and Labrador Retriever parents. Here’s the scoop on this doodle spin-off. What Makes an Australian Labradoodle Different From Other Labradoodles? What Does an Australian Labradoodle Look Like? Does The Australian Labradoodle Have Many Health Problems? Will an Australian Labradoodle be a Good Addition to the Family? Don’t let your Australian Labradoodle outsmart you! Where Can You Buy an Australian Labradoodle Puppy? Conclusion: Is the Australian Labradoodle the Dog for You? 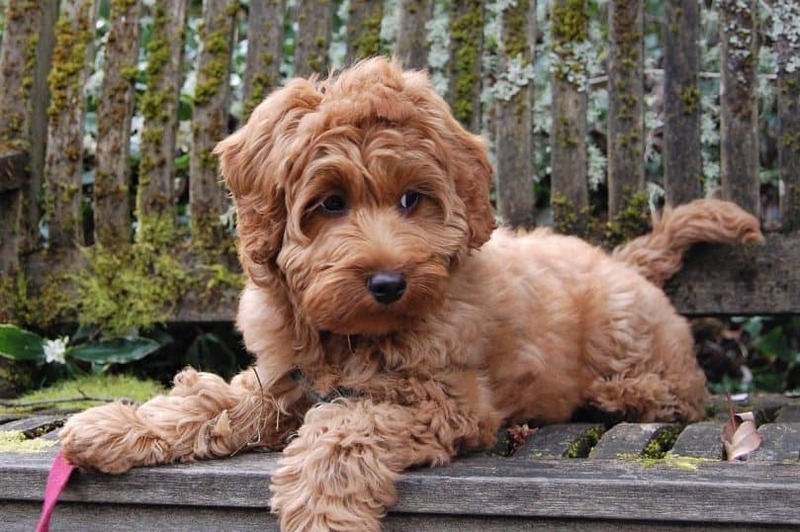 You might’ve read our guide to the Labradoodle. Now, you might be asking what makes the Australian version so special. It all began when the Labradoodle Association of Australia and the International Australian Labradoodle Association, Inc. deciding to pursue a lightbulb moment. Why not take the standard Poodle/Labrador Retriever mix and push it further to create a purebred dog? That’s where the main difference lies between the Australian Labradoodle and other doodles. The standard crossbreed is known to harbor a diverse set of inherited aesthetic and behavior characteristics typical for mixes. The Aussie crossbreed strives to differentiate itself with a set of traits specific to its kind. Poodle (Standard, Miniature, Toy): Highly intelligent, agile, friendly, hypoallergenic. Labrador Retriever: Popular service dog, good for families with kids, loves water. Irish Water Spaniel: Largest of the Spaniel breeds, sheds very little, easy to train and likes to please. Curly Coat Retriever: Cross between a Poodle and Retriever that is used widely as a hunting and therapy dog, loving demeanor and likes to be active. American Cocker Spaniel: The smallest breed of sporting dog with a jovial temper; isn’t shy and is easy to train. English Cocker Spaniel: A medium-sized sporting dog that is affectionate, but can be stubborn at times. 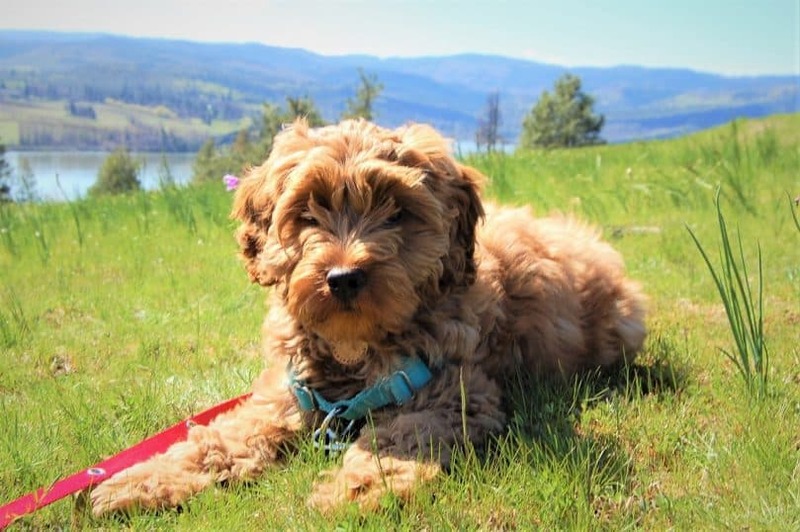 It’s important to note that even though a breed standard was established, a set of distinguishing characteristics have not been cemented, therefore the Australian Labradoodle is still considered a crossbreed. Teddy bear face and fluffy coat with big, round eyes are what’ll grip your heart when you first lay eyes on this doodle. This multi-generational crossbreed can grow up to 24 inches (53 – 60 cm) and weigh up to 77 lbs (35 kg). Because of gene inconsistencies, Labradoodles bred in the US sport coats that are not reliable if you’re looking for a dog that won’t agitate your allergies. Since their coats can be long, short or curly, a lot of times they still shed and are not hypoallergenic. The Australian Labradoodle, on the other hand, boasts a more consistent low-shedding, low-dander coat that appeals to allergy sufferers. Popular belief states that mixed bloodlines equal stronger health. The Aussie Labradoodle does live a long lifespan of 13 to 15 years, but that doesn’t mean it is free of health problems. Hip Dysplasia: An abnormal formation of the hip socket that can cause arthritis and lameness. Progressive Retinal Atrophy (PRA): A degeneration of the retina that causes vision loss and blindness. Von Willebrand’s Disease: An inherited blood clotting defect that causes hemorrhaging. To keep this crossbreed happy and healthy for years to come, she needs to burn energy for 30 to 60 minutes a day. In fact, this is a high energy dog, and exercise will not only benefit her health, but it will save your prized possessions from chewing and other destructive behavior. Australian Labradoodles make great workout partners. Take her for a jog in the park or throw the ol’ tennis ball around the backyard. With those Retriever genes, they love to fetch and go for a swim in the pool. As with any breed, your established feeding routine ultimately depends upon the size, appetite and special dietary needs of the individual dog. Stick to high-quality dog food that is rich in protein without a ton of grain and fillers. Feed your Australian Labradoodle 1 to 2.5 cups of food divided between two feedings per day. Keep those wavy tresses shiny and tangle-free with regular brushing once every two weeks. To keep hair from getting too long and unruly, consider a trim two to three times a year. This dog comes from a long line of happy-go-lucky breeds that were never bred to be aggressive and are known for their loyalty and loving devotion. The Australian Labradoodle was bred to take care of those in need, to begin with. It displays traits of tenderness and a willingness to help out and please. Intelligence is not lacking with this breed, and it will learn quickly, even picking up a few unique tricks here and there to impress you with. To bring out the best in this doodle, it craves plenty of space in the form of a house with a fenced in yard. Small apartments and long hours confined within a crate are not recommended for this energetic pup. Early socialization benefits the Australian Labradoodle to help contain out-of-control excitement when meeting new dogs or playing with small children. If left undisciplined, this breed has been known to test its owner to see what it can get away with. Remain firm and calm when training your dog and don’t let her think she’s the pack leader- you are! Daily mental and physical stimulation should be enough to help curb naughty behavior issues. This breed can cost anywhere from $1,200 to $3,000 depending on the breeder, the puppy’s characteristics and health. When shopping around for your puppy, don’t fall for the first one you see. Do your research to find reputable breeders that are passionate about their dogs and offer plenty of information. They should welcome you to their breeding grounds for a tour and introduce the parents of the litter. Also, you should be prepared to ask them questions to ensure the health and well-being of the puppies. What is the medical history of the mother and father? What health clearances are available? What is included in the price (for example, vaccines, kennel cough, microchip transfer, spay)? In turn, the breeder should be interested in your legitimacy as a dog owner. Be ready to answer questions about the size of your home, the time you have to dedicate to your new dog and if you understand the financial responsibilities associated with pet care. 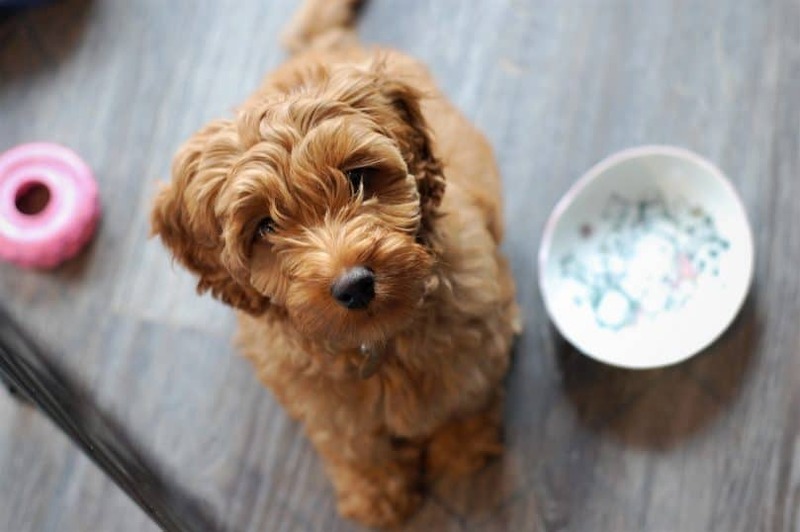 Oh so sweet and oh so loyal- you can’t go wrong with the Australian Labradoodle. This hybrid may not be aggressive, but it is high-energy. Take time each day to ensure she gets her exercise and socialization, and you’ll avoid destructive behavior and excessive jumping due to the excitement. 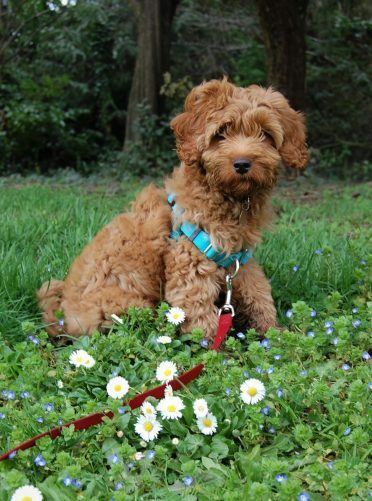 What do you think about the Australian Labradoodle? Is it the dog for you? Tell us in the comments!